The ongoing agitation by tribals at Diddalli in Kodagu (Coorg) took a new turn on Friday with Gujarat-based social activist Jignesh Mevani (in picture) joining the agitation. 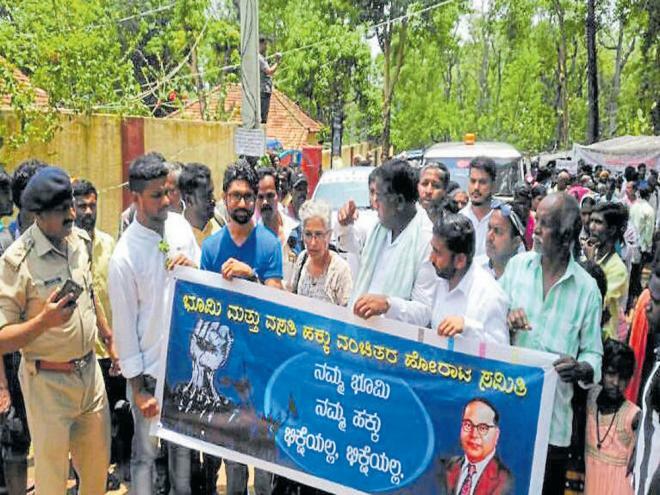 Mevani, who has led several campaigns across the country in support of Dalit rights, flagged off a march of tribals from Diddalli to Bengaluru on Friday, demanding rehabilitation of tribals in the Devamachi forest area itself in Virajpet taluk. The district administration had cleared 578 huts from Diddalli reserve forest area on last December 7. Most of the huts had come up overnight. The government clamped down following rumours that Maoist elements were supporting the tribals. On Friday, the tribal march to Bengaluru headed by Mevani was called off following intervention by chief minister Siddaramaiah who reportedly assured to hold a meeting in the next few days to sort out the problem. Activist Gowri Lankesh also participated in the march. Though the district administration has already located land for the tribals elsewhere in the district for rehabilitation, the agitators are insisting that they be accommodated at Diddalli forest itself. Addressing the agitators, Mevani said the deployment of earth moving machines during eviction drive in December, was condemnable. “It is the undying spirit of the tribals which has brought me here from Gujarat,” he added. Mevani threatened to take their cause to Delhi by exerting pressure on authorities concerned. He urged the agitators to keep the pressure on state government till they were allotted land from where they were evicted. He cautioned: “If the sites are not distributed here, then a call will be given to the tribals to vote against Congress candidates in the Gujarat Legislative Assembly election in 2018. About 15% of the population in Gujarat are tribals,” he noted. “To free themselves from the clutches bonded labour system in the coffee estates of Kodagu district, the tribals came and settled in huts at Diddalli. Both the Congress and the BJP leaders who own coffee estates are engaged in atrocities against the forest dwellers,” he charged. The government is prompt in evicting the bona-fide tribals but not acting against the mafia that is active exploiting the forest resources…. Who told this brilliant activist that there is bonded labour in Coorg? Don’t you think there is an urgent need to give a face to our side of the story and stop all mis-communication that is giving hitherto unconcerned activists, the centre-stage. If we continue faceless representations, we could well be handing them victory on a platter.